If one night you wake with the feeling that a big toe has suddenly become a battlefield, and a peek under the covers reveals not This Little Piggy but an angry red monstrosity from some old horror movie, your first thought may be to seek help. You need an M.D., you’ll think. Maybe a CT scan or even an M.R.I. But here’s what you may also need: some good P.R. Because if it turns out that your throbbing toe is caused by gout, you are going to have a lot of explaining to do as you limp through the day. What you have, any number of people will tell you knowingly, is the “disease of kings” — meaning, of course, gluttons. While Henry VIII, said to be a gout sufferer, could do his explaining with a headsman for anyone bold enough to ask him about his diet, simpler folks may need to settle for a flack. And with more and more baby boomers likely to develop the disease as they get older, that publicist could become very busy indeed. Let’s start with the basics: gout is a form of arthritis that occurs when uric acid, a waste product in the blood, forms crystals in the joints. The big toe is most famously affected. “A pox of this gout! 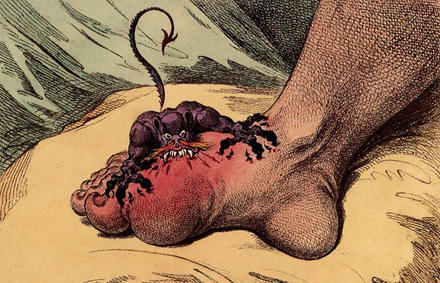 or, a gout of this pox!” Falstaff says in “Henry IV.” “For the one or the other plays the rogue with my great toe.” (Note to ad agency: can we get a spokesman for the disease who is bit less cowardly, and perhaps not quite so rotund?) But gout can affect many other joints, including knees and elbows, causing pain, swelling and stiffness. Left untreated, it can cause permanent damage to the joints. Incidence of the disease is on the rise, and more than six million Americans have had gout attacks. While everyone produces uric acid, in people predisposed to gout its level in the blood grows so high that the body cannot dispose of it properly. Imagine pouring packets of sugar into a glass of tea, said Dr. Herbert S. B. Baraf, managing partner of Arthritis and Rheumatology Associates in Maryland. “It can only hold so much in solution,” he said. And sooner or later, the sugar is going to start accumulating on the bottom of the glass. So where does all the uric acid come from? That helps explain gout’s public image problem. Uric acid forms as the body breaks down purines, a compound that occurs naturally in the body and is also found in many foods. Some big purine sources, like asparagus and dried beans, have impeccable nutritional credentials. Others, though, like red meats and organ meats, do have a tendency to end up on golden platters placed before men wearing crowns — or, at least, eaten by gourmands. Genetics, in fact, may play the biggest role in whether one gets gout, but it is hard to overlook diet. “There’s a clear association,” said Dr. Kenneth G. Saag of the University of Alabama at Birmingham School of Medicine. People who are overweight are more likely to have the disease, because their greater amount of tissue leads to excess uric acid production. (On the other hand, gout is common in parts of the world where obesity is much less of an issue.) And people who drink a lot of alcohol also seem to be at higher risk. Oddly enough for a disease of kings, the biggest culprit seems to be the nectar of the royals who inhabit the nose-bleed seats at Yankee Stadium – beer. People in the midst of a gout attack can generally do nothing but take medications, including anti-inflammatories and colchicine, and wait it out. If it helps, try to take your mind off the pain by visualizing a nice côte de boeuf. And who knows, if that P.R. campaign ever gets started, you might get what you really need: some T.L.C.